When browsing the snack aisle in the grocery store, do you sometimes feel that there isn’t really anything that you are in the mood for? Even the various flavors of different potato chips do not strike your fancy. It is than that you realize, that perhaps the great snack and chip flavor that you are craving has not been invented yet. Your taste buds are simply ahead of their time. Well, future inventor and chip connoisseur, you are in look, as potato chip company Lay’s has announce “Do Us a Flavor” contest, which allows you to design the next great chip flavor. Not only would you get bragging rights up also a chance to win $50,000 plus one percent of all future sales. Therefore if the chip does well, so will you. Canadian comedian Martin Short has teamed up with the company to promote the search for the next great flavor. Canada is known for some great and unique potato chip flavors that are harder to find south of the boarder such as dill and of course, ketchup chips. Therefore, the winning contestant will most likely have to think outside the proverbial salt on a potato idea. This is a time to let your creativity shine. Canadians get to name their flavor and suggest up to three ingredients that will go into the making of this brand new potato chip. Four finalists will be selected and then the public will crown the next great potato chip. So instead of staring at the snack aisle, create your own instead. For contest rules and details on their contest and to submit your flavor ideas, fans can visit www.lays.ca/flavour from now until April 15. To submit a flavor idea, you will be asked to provide your flavor name, up to three ingredients and your flavor inspiration (maximum 140 characters). Those without a Facebook account can submit their flavor by texting the word flavor to 101010. Now get ready for some great news! Lay's is giving away one of these wonderful prize packs to one lucky Canadian reader of The One Income Dollar. This prize pack contains flavor inspiring items for you to get started in creating your ideal flavor and is worth $325! A random draw will be held by Random.org on April 15, 2013 from all entries received. Lay's has an awesome contest and the commercials on TV are very entertaining! Love Martin Short! I really like the contest they have going on. it's one that really anyone can enter. dont have to have to be crazy creative and dont have to have any video skills. I hope they do more like this in the future. I love Lays potato chips. They are absolutely the best! This contest is a great idea, there will be someone who comes up with a very cool new flavour. I'm a huge Lay's chip fan so this sounds awesome! We love Lay's chips - they've been our favourite for years! This contest is great and has wonderful items that our family will enjoy for sure! Thanks! This was a great contest - wish my Sour Cream & Perogies flavour would have made it to the finals!! Love all the new flavours - already tried them all! lol Amazing!! Love this new contest by Lays and can't wait to see what they come up with! Hi my e-mail is martin_annette@rocketmail.com I would love to win this prize of Lay's products. I am a devote eater of Lay's chips....all flavours. I hope I can win this. The flavour that I entered was leek and peas! I think this is a great contest that Lay's is hosting for a new potato chip flavour. I'd love to see a flavour combination of green onion and dill. The Lay's contest is great hopefully the new chip flavours prove to be popular. I love lays and so do my 5 kids and husband. LOVE the Lays contest about creating flavours right now. Its would be so awesome to win!! What a fun contest, I am sure there will be some unique flavors coming out of the contest. brendaspuppy@hotmail.com Ilove the flavor contest from Lays. Thank you Lays for this contest. My fav!! Great Giveaway. I have done all the above, and your button is on my Blog. Canadafreebieseh.com. Fingers & Toes crossed for a WIN. love lays... would be amazing to win their contest :) Thanks so much for the chance! I'm looking forward to seeing WHAT the new flavor is! There have been SO many great choices - I can actually see MANY MANY new flavors coming out! Great contest! My family and I love Lay's chips. Great contest, my flavour idea is spicy taco's. Love to have some new potato chip flavours for game night! I love Lays - what a great prize! Thanks. Love the Lay's contest. I like how fans can create their own flavour and get a cut of the profit too. Lay's has the best contests ever! What a great contest lays is putting on both on their facebook page and here..thanks to both of you. This is a great contest. It really sparks people's creativity and the prize is awesome! I would love a poutine flavour. I am put quite a few flavors in. I love Lay's. Awesome giveaway, you are having. Thanks. First my biggest downfall is chips so I buy a lot of Lays and to be able to have a chance to have a flavor I would love contest is awesome! Chips! Chips! Chips!Thank You Lay's! We've loved Lay's chips for years! I think that a Salty Cinnamon Toast flavour would be yummy! Love Lays potatoe chips. Thank you so much for the contest. Amazing giveaway thanks you lays your chips are awesome. Oh yum! Lays are my favorite chips,,Ketchup are the best! Thanks. I have always enjoyed lays potato chips. I hope to enjoy even more. Nothing can beat Lays original chips! I admit I have an addiction!! Great giveaway. We love Lay's chips and all the great flavor combinations they have. They never disappoint! Thanks for the chance! Love Lays chips! 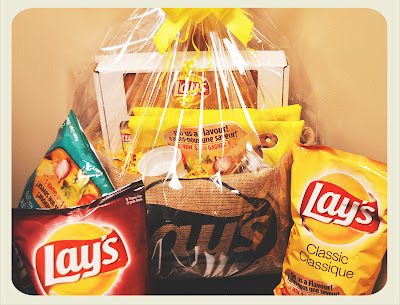 such a incredible giveaway, thank you so much, love Lays !!! Great giveaway!! I hope Lay's makes poutine flavour chips. I'm an email subscriber also. What a fun contest Lays! I've entered my suggestions! we have submitted a few new flavour ideas to Lay's, looking forward to seeing what the winner(s) are! Lay's making awesome chips, great for any occasion. I really like the Lays contest. I picked Tzatziki for my flavour -- garlic, dill, and yogurt for my entry. Pick me, pick me. Your next winner!!! Show me the money! Shared, followed and subscribed. This contest because like totally it is rad, awesome and narly dude. It is tight, fly , and off the chain. Two big thumbs up. It is by far the best in the industry in terms of prize, ease , etc. It would be a dream come true and means a lot more to me than anyone else to win the prize. Starving artist here desperately needs the prize chips to eat again. Winner, winner. Chicken dinner. A life changing experience. Top of my bucket list. The Lay's contest is a great one, original and very generous! I've been thinking about chip flavours too much lately but it's been fun trying to come up with a crazy flavor that will work for Lays. thank you to Lay's for sponsoring this giveaway on stretching the one income dollar, a great family prize. I love Lays since they have gluten free options! i love lays, specially the original chips like pringles style. It is a fantastic contest. There are so many great ideas and what a prize to the lucky winner.